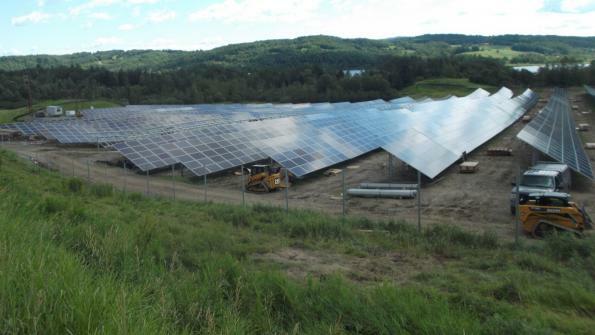 Municipalities are installing solar panels on capped landfills and/or the buffer zones adjacent to active landfills, resulting in energy costs savings, local job creation and improved sustainability. Municipalities across the country are increasingly installing solar on their capped landfills and/or the buffer zones adjacent to active landfills, resulting in energy costs savings, local job creation and improved sustainability. Landfill sites are ideal for solar development because they are typically close to a grid interconnection point, are built on land that has already been cleared and generally can’t be used for commercial development otherwise. More than 6,000 landfills in the United States were capped from 1988 to 2009, and many are still sitting idle, demonstrating the potential for solar development. Soltage-Greenwood, a joint venture between solar power provider Soltage LLC, and Greenwood Energy, recently commissioned a 2.7-megawatt (MW) solar power installation located on Casella Waste Systems’ Coventry, Vermont landfill site to take advantage of the benefits of solar. This array is the largest solar project built on a landfill site in Vermont, and is expected to generate three million kilowatt-hours of electricity annually. To date, Borrego Solar has developed and/or installed more than 20 MW of solar energy capacity across eight active or capped landfills nationwide. State and national level environmental agencies are actively promoting landfill solar development by assessing potential sites, providing funding and offering educational tools for landfill owners looking to go solar. Energy from the Coventry landfill array is sold through a 25-year power purchase agreement (PPA) to Vermont Electric Power Producers Inc., a purchasing agent appointed by the Vermont Public Service Board under Vermont’s Sustainably Priced Energy Enterprise Development Standard Offer Program. Landfill owners and operators most commonly take advantage of PPAs to go solar without any upfront costs or capital required. PPAs allow a third-party investor to take on the design, finance, installation and O&M costs of a solar project, and in return for circumventing the investment cost upfront, the customer agrees to buy the clean power produced by the installation at a predetermined rate for the term of the PPA. The rate the customer pays for the energy produced is typically less than what they’re paying for electricity from the local utility. Communities can benefit from solar in a variety of ways: using the energy to offset electricity usage on the site, assigning energy credits from the landfill solar installation to another meter nearby, and for a municipally-owned landfill, the energy generated can be used for city-owned facilities (due to net metering policies in certain states). In addition, like the situation with Casella Waste Systems, the energy credits go directly to ether public utility and the solar installation is just an additional revenue stream in the form of a land lease for the host, who’d have difficulty generating income from leasing the landfill for any other development. Solar energy systems on capped landfills are a win-win: the clean solar energy produced can go directly to the power grid, creating less strain while creating jobs and benefitting the environment.